Animonda GranCarno Sensitiv is a tasty wet food based on fresh meat for adult dogs with food hypersensitivities. The wet food is available in the following flavours: potato, chicken, beef, lamb and turkey. GranCarno Sensitiv from Animonda is a tasty wet food based on 100% fresh meat. The balanced, healthy food is specially composed for adult dogs (1-6 years) with food hypersensitivity. This food provides for your sensitive pet's complete nutritional needs. 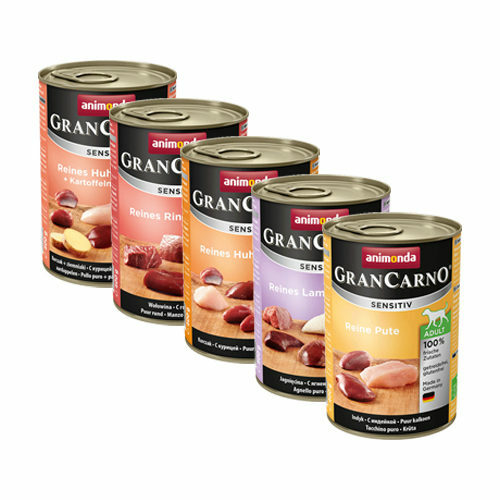 Animonda GranCarno Sensitiv is available in 5 different, delicious flavours. Animonda GranCarno Sensitiv - Chicken with Potato: 53% chicken (stomach, heart, liver, neck), 10% potatoes and sodium chloride. Animonda GranCarno Sensitiv - Beef: 63% beef (heart, lungs, meat, liver, udder, rumen, kidneys) and sodium chloride. Animonda GranCarno Sensitiv - Chicken: 63% chicken (stomach, heart, liver, neck) and sodium chloride. Animonda GranCarno Sensitiv - Lamb: 63% lamb (rumen, heart, liver, lungs) and sodium chloride. Animonda GranCarno Sensitiv - Turkey: 63% turkey (heart, liver, meat, neck) and sodium chloride. Have you used Animonda GranCarno Sensitiv before? Let us know what you think about this product.